Fortunately, yesterday was not a big photo day and I wasn’t happy with the photos I took and I wasn’t sure what I’d talk about today. So as Ralph likes to say, Lift and Shift! I have gotten so enamored of fruit. Before I started Weight Watchers, lo those many years ago I didn’t eat much of the things that were good for me. As the years passed and I became more comfortable with the program, I started to eat the good things without thinking. But for some reason, I still never ate fruit very much. I should have seen the indicators that there was something I was missing. If I was ever at a party or a buffet and fruit was offered, I always gobbled it up. I would buy simple things like apples, pears, oranges and I would never really eat them. Many times the birds and yard critters would enjoy them because I let them get all funky in their baskets. I think one of the things that got me to realize how wonderful fruit could be was the Clementine. I disavow any knowledge of the Clementine until one Christmas (many years ago, now) my friend Valerie from Kansas City brought me a little crate of them. I was not sure what they were, but I sure found out in a hurry! I now pine for, I Long for, I CRAVE Clementines. The sad thing is, you can’t get them year round. Something I also didn’t realize. They are wonderful and delicious and very inexpensive when they are in season. As they start to go out of season they don’t taste so good AND they can be Very expensive. I must confess that I have actually paid $9.99 for a crate of them. I won’t do that anymore because, sadly they were terrible on top of being outrageously priced! I’ll have to make do with the what we have now. I’ve learned the joy of the seedless watermelon, and I can always get cantaloupe, honeydew and pineapple at the local produce place. Sadly, though the last couple of pineapples and cantaloupes were tiny and went bad very quickly. There is something to the idea of buying local and I KNOW that pineapple and cantaloupe don’t grow in New Jersey. Ralph and I enjoyed a Huge fruit combo bowl last night, which I can’t show you because I don’t have a photo! Pineapple, cantaloupe, watermelon and strawberries. Excellent and filling. So since I didn’t have any other photos to share I’ll leave you with one I took in Florida. 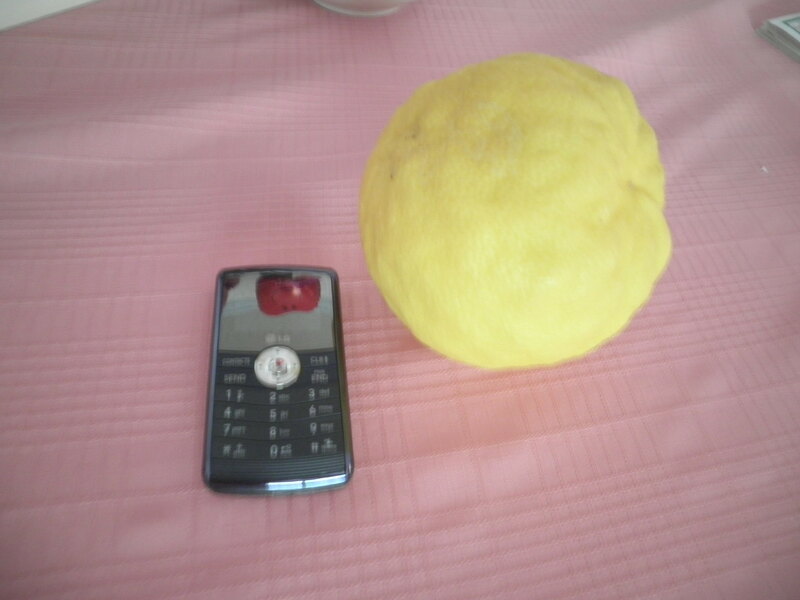 It is a photo of a lemon, yes a lemon, not a grapefruit that came from Gail’s brother’s lemon tree. My phone is in the photo to give you some scale. Yes that’s a lemon. Alice was bringing it home to have with her tea…boy, she Likes her tea! I think that qualifies for Bigger Than My Head! I got lots of sorting and packing accomplished yesterday. I love the idea of listening to a book while I work. It makes the time goe so quickly! I actually finished the first book. I had to stop to go to the library to get another one. The Art of Mending was ok.
I’ve started In The Woods by Tana French. Pretty good so far. We’ll see how it goes! Off to exercise and then on to my project. That basement is going to be sorted and cleared in NO time! I could eat fruit all day long. Love fruit! And what a great idea listening to a book while getting stuff done. In The Woods was a good one if I remember correctly. Thanks, Tina! If I had a clue that this would keep me working on my projects, I would have done it a LONG time ago! Here’s to getting things accomplished…something you’re very good at!